Ubiquiti Networks offers Power over Ethernet (PoE) Adapters to power a variety of Ubiquiti products. 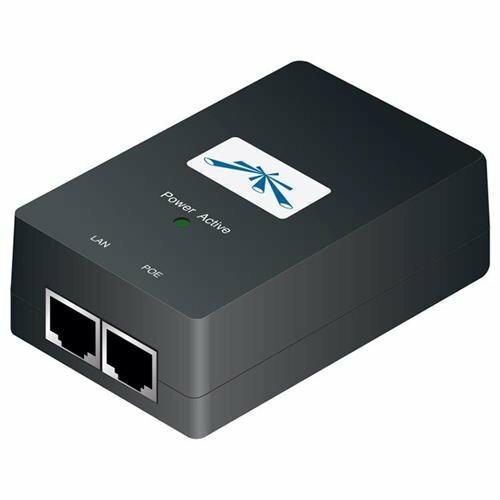 The PoE Adapters are compatible with most Ubiquiti PoE devices, including: airFiber airMAX EdgeMAX mFi UniFi AP UniFi Video / airVision Ubiquiti PoE Adapter Compatibility with the airGateway Specific PoE Adapter models are designed to work with the airGateway. The airGateway is a compact CPE (consumer premises equipment) gateway with built-in Wi-Fi used to connect the subscriber's local network to the WISP network. The airGateway is available in three models: airGateway Standard model with an internal antenna airGateway Pro Dual-Band Wi-Fi model with an internal antenna airGateway-LR Long-range Wi-Fi model with an external antenna for extended range Protection Ubiquiti PoE Adapters provide a variety of features to help protect your PoE devices: Surge protection Clamping protection Maximum surge discharge Peak pulse current AC cable with earth ground. Electrostatic discharge (ESD) is the leading cause for outdoor device failures. You can effectively protect against ESD damage using a grounded Ubiquiti PoE Adapter, TOUGHCable and TOUGHCable Connectors.